It is simple to learn how to make Kirigami hibiscus. This pretty flower requires few folds and mostly relies on cutting to create the look of the flower. 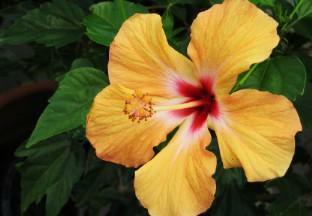 Hibiscus flowers are tropical looking flowers with five petals. They grow best in warm climates, both inside and out. Care for hibiscus by bringing them inside when the weather grows inclement. The most commonly seen colors for these flowers are bright red, orange, yellow and pink. These flowers typically attract butterflies, bees and other garden insects. Growing hibiscus is generally easy, but not everyone has a green thumb. For those people, paper hibiscus are the perfect alternative. The hibiscus flowers are very simple and are a great addition to an origami flower bouquet. It is also a perfect flower to use in an origami lei. Hand the lei out at themed luau parties and tropical celebrations. Trace the petal cutter onto the backside of an origami paper. Cut out the flower shape. Add additional cuts where the petals separate to create a more distinct line. Gently curl the edges of the petals downwards for a natural look to the flower. Use the top of a pencil to make a small indent in the center of the paper for the stamen. Cut a small thin strip of the origami paper and roll into small cylinder. Secure with a piece of tape. Dab a bit of glue into the center of the hibiscus flower and add the stamen. Wait for the stamen to dry. Twist the bottom of the hibiscus and wrap some of the green pipe cleaner around it to create a stem. Make leaves for the flower by folding the green origami paper in half and cutting out a leaf shape. Use the paper punch to put a hole in the center of the leaves and slide onto the pipe cleaner stem. To make a two-layer hibiscus, use a smaller petal cutter and place the cut paper on top of the larger flower. Choose a vibrant contrasting color or a darker color in the same family. Secure it with a fastener and continue to follow the instructions listed above. An alternative to using the pipe cleaner stem and paper leaves is to find origami or Kirigami instructions for a paper stem and leaf to add to the hibiscus flower. Folding paper flowers is something that many origami and Kirigami enthusiasts master rather quickly. An origami or Kirigami hibiscus is not a typical flower, so finding complex instructions is rather challenging for paper folders. Both book and magazine articles provide information on how to make specialty flowers, like how to make Kirigami hibiscus, that are not traditional models or that have complex diagrams. One book to consider is The Guide to Hawaiian Style Origami by Jodi Fukumoto. A hibiscus model is included in this book. A second book to consider is Origami Flowers by James Minoru Sakoda. While the hibiscus is not specifically mentioned, the table of contents indicates that five-petal flowers are included in the book. If you have access to library that has back issues of foreign magazines, look for ones that include hibiscus models in them. According to the Origami Sociëteit Nederland, a hibiscus model folded by Everdien Tiggelaar is in no. 7 edition of the 1992 Orison publication. Similarly, the Sept. 25, 2001 (no. 69) edition of Origami Tanteidan contains an edible hibiscus from Tomoko Tanaka. Follow the LoveToKnow slideshow "Make Simple Tissue Paper Origami Flowers for a hibiscus that is similar to those found on shrubs, not following the typical five petal design. Additionally, the tutorial slideshow Kirigami Flower Pattern offers a quick and easy way to cut out a multi-petal flower.